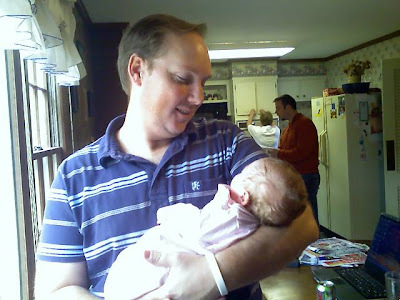 Here is my new neice Pressley happiy asleep in my arms. Now that I think about it I have an uncanny ability to put people to sleep. Maybe it is my spiritual gift! My dad is out in the yard playing catch with Andrew and Mom is hard at work in the kitchen while Justin tries to keep up with her by eating everything she is making. Amy is enjoying the falling leaves, and Abby is working on her babysitting technique.